The database covers 15 years of reports and holds 190 states of emergency. The data shows that a high number of states of emergency are declared in Latin American countries. 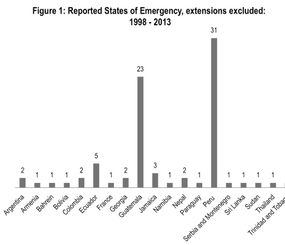 Whereas there are a vast number of countries that have declared and exercised emergency powers across the world throughout the period of 1998-2013, it is only a relatively small number of countries that have reported their states of emergency and related human rights derogations to the United Nations (figure 1). There is a tendency visible in the type of articles that is derogated from during states of emergency. Countries specify the articles and specific paragraphs from which they will derogate during the state of emergency. States never derogate from all possible articles at the same time. Therefore, there are a few key articles that stand out, as is illustrated by the figure on the next page. On the other hand, a number of articles are not derogated from in the first place. 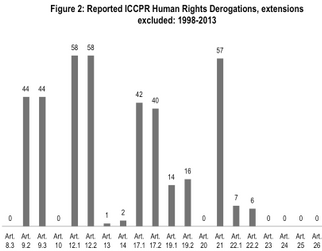 Figure 2 shows that most countries report derogations from Articles 12 (58 times) and 21 (57 times) in particular, and articles 9 (44 times) and 17 (paragraph 1; 42 times, paragraph 2; 40 times) after that. Article 12 paragraph 1 concerns the right to liberty of movement and freedom to choose his residence. Article 12 paragraph 2 concerns the right to leave any country, including his own. Article 21 concerns the right to freedom of association with others, including the right to form and join trade unions for the protection of his interests. Article 9 concerns the right to the liberty and security of person, without being subject to arbitrary arrest or detention, as well as the right to being informed of the charges and the right to trial within a reasonable time or to release. Article 17 concerns the right to not be subjected to arbitrary or unlawful interference with his/her privacy, family, home or correspondence or unlawful attacks on honour and reputation. For more information please consult working paper 1, which introduces to the setup of the database, the methodology us it, and it illustrates the findings and draws first preliminary conclusions. The links below will provide you with the codebook of the database, including a detailed descriptions of the categories above, and the database in xls format.